The answer to the last question is: not only does it work really, really well, but clients like Karis make it easy. 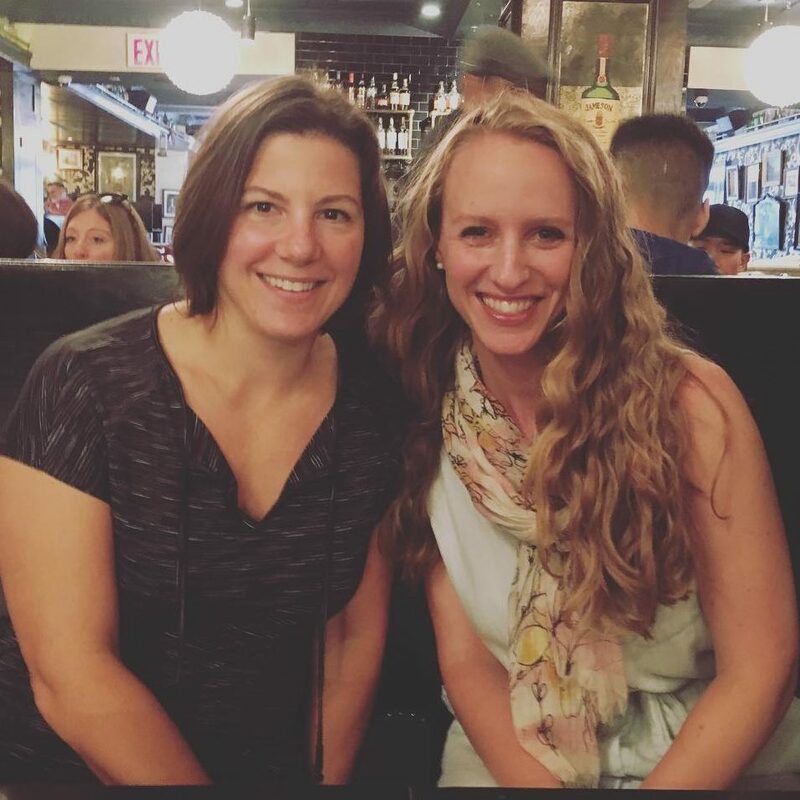 Karis is a 39-year-old financial advisor in Duluth, Minnesota, and we connected because of an article that I wrote about Gretchen Rubin’s Four Tendencies last year. Like many of my successful remote coaching clients, she identifies herself as an “Obliger” (check out Gretchen Rubin’s Better Than Before or The Four Tendencies to get a better idea of your Tendency). This means that all she needs is outside accountability and structure to help her put “a little check mark” next to her goals. Since we’ve been working together, her consistency and positive attitude have helped her to dramatically increase her strength (she now deadlifts more than her bodyweight!) and re-shape her outlook on fitness, fat loss, and mindset. Obligers benefit hugely from accountability! One of my friends texted me and said, “Would you do this with me?” It’s not a path I would have gone down by myself, but when you have somebody else that’s willing to go down the path with you, it just makes it a lot easier. 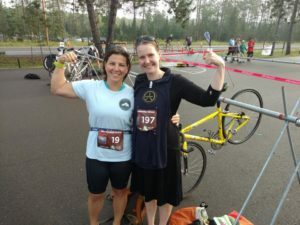 It was scary for me to think about doing a sprint triathlon and completing it, but I was motivated to keep up with the training schedule, because I knew that she was. We had this partnership and this accountability to each other, we knew what we had to do to achieve the goal, and during the triathlon we stayed together and accomplished it together. Knowing that we were doing that together was huge motivation for me. Ask yourself, “What’s the worst that could happen?” Our first goal was to not die. We had absolutely no idea how it was going to go. So the next goal after “not dying” was simply to finish injury-free. We can’t let fear of something new stop us from trying. So the worst that could happen, and my friend and I discussed this, was that our tires would fall off and we have to walk for five miles. If that’s the worst that happens, that’s do-able. I would say that for me and my gal pal, it really pushed a lot of our boundaries. There were Saturday mornings when we got up very early to do long bike rides, but we were able to catch up. It was really great for our friendship. That was something unexpected. We both live “busy” lives, and to spend 2- 3 hours with her on a Saturday morning, even if we had to couch it that we were “training,” was a treat. [What was the biggest challenge?] Getting everything in. There’s obviously a prescription that you need to follow – run, bike, swim – and you have to get the miles in. You have to get the laps in. You’ve just gotta pound the pavement. You’ve gotta be on the bike. Having work, nonprofit and volunteer events that I’m involved in, my husband and the home fires… it was a challenge to make sure that I got the miles in. What worked for me was really looking at my week in chunks. I would look at my work schedule, I would look at our personal calendar, and I would also look at my volunteer schedule, along with the training schedule. So I was kind of looking at four different schedules. It sounds a little insane, but in today’s world, I would venture to guess that’s what most people are doing. So chunking the week, and then taking one week at a time, didn’t feel as overwhelming to me. 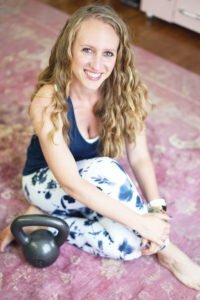 Implementing a lot of the strategies that you and I talk about – being prepared, not only meal prep but also knowing which days I was going to run, which days I was going to bike, which pool I was going to swim at – having my week laid out for me – was the only way I could set myself up for success. Maybe it is my line of work, and maybe it is my Type A “only child” personality, but it’s planning. Again, I have got to take the week in chunks, or take the trip in chunks, and really think about strategies before I get in the moment. I can get caught up in the moment when the plate of margaritas and chips and salsa shows up, and I’m two margaritas and a whole pile of nachos down before I even think about it. Working with you has taught me strategies for moderation, in terms of preparing. In terms of training, I’m a planner as well, so I’ll go online and take a look at the hotel gym. With Yelp and Google reviews, I can see if they have a good gym, or if I need to look at a local 24-hour fitness place to get a pass for the week. I’ve had to do that as well. It comes to – for me personally – really planning out where I’m going, what I’m going to do, what I’m eating, and also packing some snacks and things. You get in a situation where you’re ravenous, and then someone’s coming through the office with ice cream bars, and of course I’m going to have an ice cream bar because it’s 3 PM and I’m hungry. But if I have a little snack, I may be able to make a better choice. Prior to going into training, I was in a deficit, focusing on losing weight. Going into the triathlon training, [weight loss] took a little bit of a back burner. When you’re going out and biking maybe 16-20 miles, that’s not necessarily the time to lose weight. The goal was getting the nutrition I needed to make sure I could make it 20 miles, and then still have energy for my entire day. I have to work, I have to see clients, and there were things in the evening I needed to attend, and that was a little tough mentally, to not see the scale budge much during that time. But by the time the triathlon came around, I felt well-fueled, well-rested, and well-prepared. When I talked with a couple of my girlfriends who are triathletes, they said, “Oh, no, this is not the time to lose weight. You have to fuel for success.” And that’s exactly what happened. I fueled for success. The triathlon went off without a hitch. We exceeded some goals, and now, putting that little accomplishment and that little check mark on my little wall, I can switch gears again and go back into a deficit. I appreciate your approach and your practice, because it’s not always about weight loss, and that helped me during those three months, to know that it was okay. You said to me, “If you start to gain 5-10 pounds, then we might need to have a conversation.”* But the maintenance was exactly where I needed to be. It was okay. It gave me permission. *Side note from Rachel: I don’t police my clients’ weights. However, I knew that part of my job was to help her set her expectations for maintenance during the training season. Sometimes, there is a tendency – when the focus switches away from fat loss – to enter a “free for all” mode, and I consider it part of my work to help people avoid an all-or-nothing mindset and keep the path going right down the middle ground. We were telling all of our friends and family that it would take 2:30. And as we were doing the run, I had my watch on, and I knew that if we picked it up a little bit, we could finish that 5K run in under 30 minutes. I thought, “We can do this.” As we got to the finish line, there’ s a picture of me pointing at the time. We came across the finish line unadjusted at 1:52. It was so — I can’t even describe it. Its as unbelievable. It was not anything we thought was attainable. All of our girlfriends and their significant others and our spouses and my mom were all at the finish line, and they were crying for us, and we felt so proud. We had done this together, and we had pushed each other, and there was such a feeling of accomplishment. Life’s just too short. My guess is that many of your clients are so bold and brave in so many other aspects of their lives, and it’s hard to try something new. It’s tough to put yourself out there. But the feeling of accomplishment after you do that, and being able to maybe inspire others, is just an immeasurable feeling. Note from Rachel: If you, too, feel that the sky could be the limit for you if you only had that extra nudge of accountability and structure (and someone checking in on you), feel free to get in touch. → Sugar Addiction: Fact or Fiction?